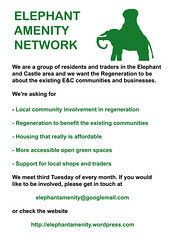 A summary report setting out the debates and conclusions of the visioning workshop held by the Elephant Amenity Network on 28th January 2012 is now available. The event was developed to discuss themes arising from the council’s forthcoming SPDand relating to a future possible Neighbourhood Plan for all or part of the area. The aim of the session was to animate the SPD document, to introduce Neighbourhood Planning, and to consider uses of S106 /Community Infrastructure Levy alongside a reinvigorated project bank.